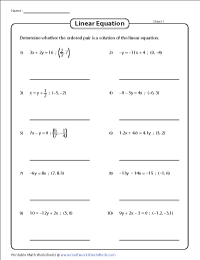 This vast collection of equation of a line worksheets has been meticulously drafted with the intention of improving logical and analytical skills of students. Find the linear equation of a line using the point-slope form, slope-intercept form, two-point form, two-intercept form, etc. 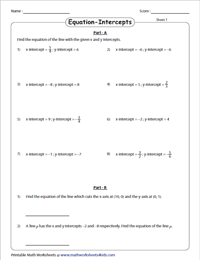 Also presented here are worksheets where children will have to find the equations of a line that are either parallel or perpendicular to another line. Free worksheets are also available. 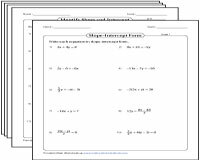 This group of worksheets will require students to write the equation of the line in standard form: ax + by = c. Ensure that the coefficients are integers. Use the download option to download all PDF files under this section. Students require to determine whether the ordered pair is a solution of the linear equation by identifying the value of one variable based on the given value of the other. Use these worksheets for a thorough practice of the concept. 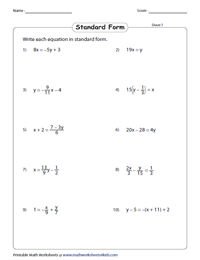 Gain complete access to the worksheets that require learners to write the equation in the slope-intercept form y = mx + b. Use these printable worksheets for a great learning experience! 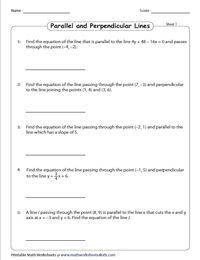 Obtain these worksheets that entail determining the equation of the line, based on the point and slope provided. Find the equation of a line by using the point-slope formula y - y1 = m(x - x1). 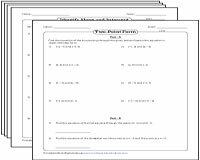 This huge collection of worksheets helps children to find the equation of the line passing through two points. To find the equation, apply point-slope formula or two-point formula - (y - y1) / (y2 - y1) = (x - x1) / (x2 - x1). Employ the answer keys to verify your responses. 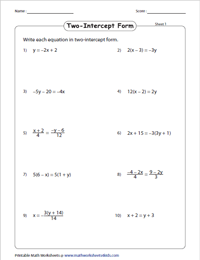 This series of worksheets will require students to convert the given linear equations in two-intercept form: x/a + y/b = 1. There are ten problems in each worksheet. Based on the given x and y intercepts of a line, students should find the equation of the line in standard form. Word problems have also been thrown into the mix for variety! Find the x-intercept and y-intercept of a line using the given equation. x-intercept is a point in the equation where the value of the y coordinate is zero and vice versa! 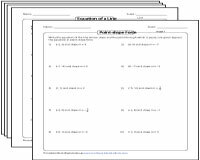 This assembly of worksheets features various geometrical shapes for which linear equation of the lines is provided. Find the unknown value (missing coordinates/missing coefficients) from the given equation of the line. 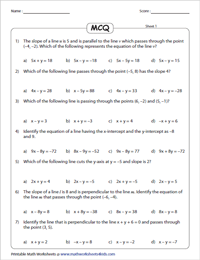 These concise word problems require learners to find the equation of a line passing through the given point, that is either parallel or perpendicular to the given line. 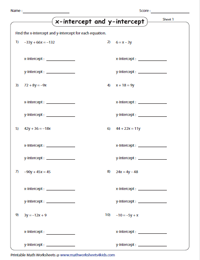 Boost your child's analytical skills with this array of worksheets that feature MCQs. Children will have to identify the correct equation of a line based on the given points, slopes, intercepts or parallel/perpendicular lines.